Fiona Hill, pictured above, is George Soros' mole in the Trump White House. She was the catalyst to H.R. McMaster's firing yesterday as the country's top National Security Adviser, according to Roger Stone. Stone has known President Donald J. Trump for 40 years. Stone was Trump's former Campaign Manager for President. Fiona Hill worked six years for George Soros' Open Society in New York. She also worked three years for the National Intelligence Council in Washington, D.C.
McMaster hired Fiona Hill as his top adviser on March 3, 2017. Hill was appointed as a Deputy Assistant to President Trump and his Senior Director for European and Russian Affairs. Hill set up McMaster, according to Stone. She set up meeting between Condoleezza Rice and McMaster. It got him fired, said Roger Stone. 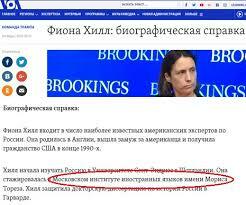 Fiona Hill wrote the book, "Mr. Putin". It was published by the Brookings Institute. Fiona Hill is "a Russia expert", according to CNN.